The object of the tests presented is to assess the degree of setting and hardening in mortars within the first 24 hours by means of electrical conductimetry. The first stage of the task involved developing a suitable test method. 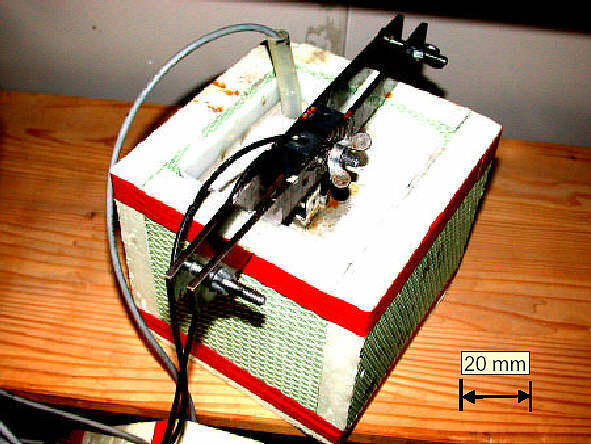 A variety of electrode systems were examined as part of preliminary tests, the object being to determine suitable materials and measurement-cell geometries. Additional tests were conducted in order to establish the influence of measurement frequency on changes in electrical conductivity. As part of the main tests, the differences between ordinary portland cement and blast furnace slag cements in terms of their setting and hardening behaviour were analysed.In addition, the influence of retarding agents on the setting and hardening and on the changes in electrical conductivity were determined. The results show that typical curve characteristics pertaining to changes in levels of electrical conductivity, e.g. when retarding agents are used, are shifted backwards in time and correlate well to the setting and hardening process in mortars. A correlation was also established between the results of the electrical conductivity measurements and the results of penetration measurements with the Vicat-test. Change in the degree of electrical conductivity of mortar is closely linked with the level of hydration of the cement. Because of its generally inert characteristics, the aggregate will only influence electrical conductivity indirectly. It is brought about almost exclusively by the mixing water as water contact will cause the alkali salts in the cement as well as the calcium hydrate to dissolve (dissociation), becoming electrically charged ions. The result is a solution of electrolytes which is highly conductive , . As the level of hydration increases, the quantity of electrolytic solution in the mortar's pore system drops as products of hydration form on the surface of the cement particles. It is therefore possible to correlate hydration processes with the electrical conductivity of mortars. As part of the research project SFB 532 "Textile reinforced concrete - the development of a new technology" at Aachen University it is proposed to facilitate industrial series production of textile reinforced elements. The aim is to offer dimensionally stable consistencies immediately after production in order to satisfy requirements in respect of establishing and determining economical demoulding times. The aim in the long- term, therefore, is to record the setting and hardening process of the concrete by means of continous electrical conductivity measurements, thus enabling greater control over demoulding times. The object of the work presented here was to develop a test method and, first of all,to conduct conductivity measurements by principle to assess setting and hardening patterns of mortars during the first 24 hours of hydration. Standard mortars were used for the tests to start with, and only individual parameters of relevance to electrode- design (e.g. electrode geometry, spacing) and mixture-composition (e.g. cement- type) were varied. The fine grained concretes used for the textile reinforced concrete, which are generally containing pozzolanic and other additives as well as admixture, will be examined at a later stage. Having decided on the test method and electrode-design comparative tests were conducted to establish a suitable measurement frequency. In order to show the applicability of the test method developed the influence of different cement-types and retarding agents on changes in the electrical conductivity was examined. Finally, a correlation was carried out between the setting and hardening patterns established on the basis of the electrical conductivity measurements and the characteristic values of the consistency tests conducted with the Vicat-apparatus and the "bag-test". Standard mortar in accordance with DIN EN 196-1  with an ordinary portland cement(OPC) CEM I 52.5 N and blast furnace slag cement CEM III/C 32.5 N as per Table 1 were used for the purpose of conducting the measurements. The admixtures used were glucose as retarding agent and a superplasticizer based on polycarboxylate-ether. Table 1: Composition of the mortars. The measurement cell which was used in the tests presented in this paper comprises two stainless steel electrodes (steel V2a) 40 mm x 40 mm in size and made from perforated plate (plate thickness d = 1.3 mm), which are held in place in a metal clamping device with the assistance of plastic blocks (Fig. 1). The electrodes can be arranged at distances of 10 to 80 mm by means of a scale on the metal clamping device. The coaxial cables used as connecting cables, which are soldered onto the electrode,have an electrical inherent resistance of approx. 1.50 W. The backs of the electrodes were covered with insulation tape to ensure that the electric flux lines run within a defined space between the electrodes and not from the back of one electrode to the other one as well . 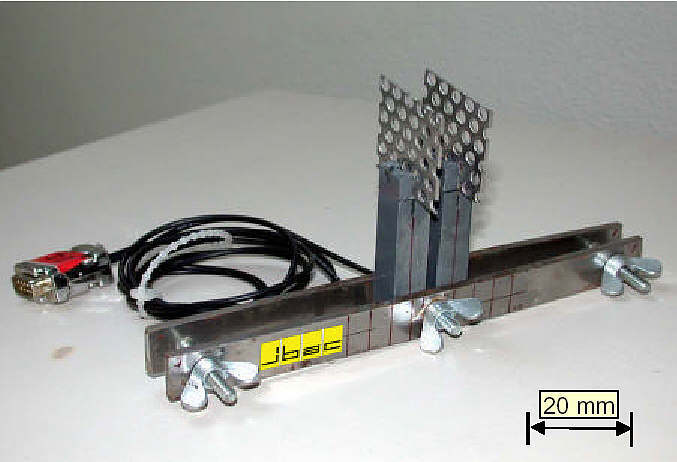 Fig 1: Measurement cell, electrodes made from perforated stainless steel. Fig 2: Measurement cell and temperature sensor. After mixing, the mortar is filled into a plastic container, which has been insulated using foamed plastic and which has a capacity of 1,000 ml (Fig. 2). Insulation serves to prevent hydration heat to discharge and to guarantee consistent temperature conditions for the different measurement procedures. In addition, it is possible to conduct a comparison of temperature-developments in mortars containing different cementtypes with the integrated temperature sensors. In the literature, details for the exponent b of Eq. (2) for mortar and concrete vary between 2,000 and 3,000 Kelvin [B6]. In the present tests, the exponent b was determined via fitting the electric resistance of water at different temperatures, i.e. approx. 20° C and 40 °C. Applying Eq. (2), the electric resistances measured with the measurement cell per Fig. 1 were converted to reference resistance R20. Ultimately,the best fit was found for the exponent b = 2,500 K (Table 2). Table 2: Measured electric resistance R of water at varying temperatures and calculated reference resistance R20,calc. The electrical conductivity is calculated according to Eq. (3) from the cell constant W and the electric resistance R, which is determined with an RLC-bridge (Resistance R, Inductance L, Capacity C; Model Philips PM 6303) at an alternating current frequency of 1 kHz. The electric resistance measured is recorded at intervals of 5 minutes. First of all, the measurement procedure provides the values for the electric resistance R of the mortar as well as for the resistance RT measured using a temperature sensor over time. Applying Eq. (2), the electric resistance R20, where T = 20 °C, is determined on the basis of the measured data. Taking the reciprocal value and taking into account the cell constant W, the electrical conductivity is derived applying Eq. (3). The derivativion of the electrical conductivity curve is used in the following Figures to illustrate the results of the electrical conductivity measurements. Commencement and end of the setting of the mortars are determined applying the Vicat-test according to DIN EN 480-2 . The bag test serves to determine any visible or tangible change in the consistency of the mortars within the first 6 to 7 hours. After mixing, the standard mortar is filled into a plastic bag located in the container which is used for the electrical conductivity measurements so that comparable setting conditions can be assumed. The plastic bag filled with mortar is lifted out of the container at intervals of an hour and an assessment of the consistency of the mortar is conducted on the basis of its degree of plasticity. This plasticity is defined in terms of soft, brittle, crumbly, dimensionally stable, break-proof, firm and compact. As pressing the mortar, and in particular in the first few hours, causes its structural constitution to be destroyed, five to six test pieces were produced together for each test to be conducted. In the case of the bag test, the subjective feeling experienced has a certain influence on the results, but nonetheless, the results produced allow a correlation of the changes in the consistency of the mortar from soft to compact and characteristic changes in the electrical conductivity curves. For the purpose of verifying the chosen frequency of 1 kHz for the electrical conductimetry,comparative tests were conducted using a measuring device developed by the company Bilfinger Berger AG (Neukum PM 2000) , which covers a frequency range of 50 Hz up to 110 kHz. This measuring device gives the reciprocal value of the electric resistance, i.e. the electric conductance value G given in Siemens unit. During the measurement process, the frequency undergoes adjustment depending on the change in the electric conductance value. In the case of electric conductance values < 1 mS, a frequency of 50 Hz is chosen, rising then linearly to a maximum of 110 kHz in the case of electric conductance values > 100 mS. Therefore, the effect of polarisation at the electrodes, which is growing with high electric conductance values and the corresponding current conduction, is reduced due to the frequency adjustment during the electric measurement. The temperature of the mortars during testing is included automatically in the electric conductance value , . In order to determine the electrical conductivity k, the electric conductance value G measured is multiplied by the cell constant W of the measurement cell used. Fig. 3 shows the results for a standard mortar with a CEM I 52.5 N. In the test described (Fig. 3), the frequency drops from 34 kHz at the beginning of the measurement to 9 kHz at the end according to the electric conductance value G.
Fig 3: Influence of the measurement frequency on the electrical conductivity. Apart from a difference of approx. 1 mS/cm, the measurements conducted as part of the test model developed at a constant frequency of 1 kHz and those secured with the assistance of the borrowed unit with its self-adjusting frequency range in terms of the progression of electrical conductivity in mortar proved, for the most part identical. Measurements carried out on cement pastes produced similar results with the result that a frequency of 1 kHz was chosen for the tests. Further tests applying electrochemical impedance spectroscopy have also confirmed that effects of polarisation on the electrodes etc. are negligible already for frequencies of approx. 1 kHz for the testing method presented here . Fig. 4 shows the values of electrical conductivity and the change in electrical conductivity for a standard mortar containing an OPC CEM I 52.5 N during the first 12 hours after mixing. The curve progression representing the change in electrical conductivity over the period reveal characteristic features which are mutually related to the hydra tion processes ongoing in the mortar. First of all, at the beginning there is a first maximum value in the curve relating to change in electrical conductivity which coincides with the so-called induction phase within the process of hydration. Initially,there is a dissociation of the alkali salts in the cement in the mixing water, and a solution of electrolytes is created which is highly conductive. As gypsum or anhydrite is added to the cement in order to avoid immediate hardening, a layer of ettringit crystals form over the entire surface of the cement particle. They form as a result of the reaction which takes place between calcium sulphate released and the C3A contained in the cement, but are, however, too small to create a sturdy link between cement grains. Setting cannot begin to take place at this point in time , . The initial increase in electrical conductivity already described is now followed by a continuous decrease. The induction phase is followed by a period of inactivity, during which time the solidification process gets underway. The ettringit crystals, which were initially very small, have now developed to become considerably longer and, to some extent, span the pores, thus linking the cement grains up with each other. This gives the cement paste a certain firmness. The increase in the hydrate phases can be accounted for by a re-crystallisation of the ettringit. The first calcium silicate hydrate needles (CSH-needles)  are formed at the end of the period of inactivity. This phase witnesses the first minimum value in the curve relating to change in electrical conductivity, and in the case of the test described it appears approx. 5.5 hours after completion of the mixing process. The consistency tests reveal a connection between the first minimum value on the result curves and solidification of the mortar. Applying the Vicat-test, it was established that, in the case of the standard mortar containing CEM I 52.5 N, setting started after a period of approximately 5 hours and ended after approximately 6 hours. The period in between coincides exactly with the characteristic minimum (1. Minimum) of change in electrical conductivity. Fig 4: Correlation between consistency tests and electrical conductivity measurements. On the basis of the results of the bag-test, the period during which consistency changes from soft to compact has been divided up into four sections as per Fig. 4. Analysed in the context of the results produced by electrical conductivity measurements, it can be seen that the first characteristic minimum (1. Minimum) of the electrical conductivity curve falls within the period (4.5 to 6 hours after commencement of the measurement procedure) during which the mortar has assumed a dimensionally stable state, i.e. the mortar maintains its shape in the bag and can no longer be made to crumble by hand, but rather breaks up into large pieces. This confirms the results of the Vicat-test, which indicate that there is a correlation between the first characteristic minimum value in the curve relating to change in electrical conductivity and the process of setting of the mortar, which, at this stage, has taken on a certain stiffness. The curve progression shows a second characteristic maximum and minimum value, respectively (2. Minimum/Maximum) which, however, cannot be clearly linked to specific hydration processes. They may well be an indicator of the so-called acceleration phase, during which actual hardening of the cement paste takes place. Finally, after approximately 10 hours, there are given the first indications of a continuous decrease in conductivity, which coincides with the so-called final phase, during which period the velocity of growth of the hydrate phases responsible for the hardening processes decreases continously. Comparative tests were conducted using a blast-furnace slag cement CEM III/C 32.5 N and an OPC CEM I 52.5 N to investigate whether later commencement of the setting or a slower process of setting of the blast-furnace slag cement has an impact on the curve progression of the change in electrical conductivity. Fig 5: Change in electrical conductivity for mortars containing CEM I 52.5 N and CEM III/C 32.5 N.
Fig. 5 shows that the first characteristic maximum value for the standard mortars containing blast-furnace slag cement (CEM III/C 32.5 N) appears at a much later stage than for mortars containing OPC (CEM I 52.5 N), i.e. when blast-furnace slag cement is used, the level of electrical conductivity rises over a considerably longer period before it finally decreases continuously as a result of the subsequent hydration processes. This leads to the conclusion that the alkali salts in the blast-furnace slag cement dissolve more slowly than those in the OPC. The level of stimulation of the cement is lower as a result of the lower proportion of OPC clinker. Later on, the level of electrical conductivity of the standard mortar CEM III/C 32.5 N containing blastfurnace slag cement decreases slowly and continuously, which is indicated by the absence of change in the level of electrical conductivity until approximately 16 or 18 hours into the measurement process. Only then changes in electrical conductivity (1. Minimum and 2. Maximum) can be observed, which indicate the setting of the mortar CEM III/C 32.5 N. Fig. 5 shows two different measurements for the mortar CEM III/C 32.5 N and therefore, the variation in results. In the case of the standard mortar containing OPC, on the other hand, the first characteristic minimum value (1. Minimum) and the second maximum value (2. Maximum) have already appeared in the curve relating to change in electrical conductivity after approximately 7.5 to 9 hours. The consistency tests confirm that the mortar containing OPC is already setting during this period and is displaying initial indications of inherent stability. Guided by the characteristic curve features, the results show that later initiation of the period of inactivity and the process of setting when using blast-furnace slag cements become readily apparent with the aid of electrical conductivity measurements. The connection between electrical conductivity and setting performance is illustrated in further tests conducted on mortars containing varying amounts of retarding agent. Fig. 6 shows that the first characteristic minimum value (1. Minimum) and the subsequent second characteristic maximum value (2. Maximum) in the curves relating to change in electrical conductivity are shifted backwards in time where the amount of retarding agent involved is seen to increase. An approximate correlation is possible here between these curve characteristics and the transition from soft to dimensionally stable in consistency terms and, therefore, the process of setting of the mortar, though not, however, its development in terms of strengths. The effect of the retarding agent on the setting and hardening behaviour is therefore reflected in the curves of the electrical conductivity. Fig 6: Influence of retarding agent on changes in electrical conductivity. On the basis of the measurements conducted, it has been possible to show a correlation between hydration processes in mortars and their electrical conductivity. Later or delayed setting of mortars containing a blast-furnace slag cement as opposed to OPC, or as a result of the addition of glucose as a retarding agent, was readily apparent from the curves relating to the changes in electrical conductivity. Characteristic changes in the curves could be clearly allocated to the various phases in the hydration process. This was confirmed on the basis of the consistency measurements which were carried out simultaneously. It was possible using the characteristic curve features to define the setting times determined on the basis of the Vicat-test and the changes from a soft/plastic consistency to one which could be called inherently stable as determined pragmatically with the assistance of the bag-test. In particular, as the actual point in time of initial dimensional stability can be concluded within certain limits from the course of the curves relating to change in electrical conductivity, in principle the test must be looked upon as being suitable for application in connection with the planned determination of appropriate demoulding periods within planned production processes. Compared with the consistency tests using the Vicat-test and the bag-test, electrical conductivity measurements offer a continous and nondestructive facility for securing an assessment of setting and hardening patterns in mortars. Further tests will require to be carried out, however, before electrical conductivity measurement procedures can be used for the purpose of controlling demoulding times in the production of textile reinforced concrete elements. Further tests within the research project SFB 532 will seek to optimize the test method with the electrodes to be integrated into the structural component, thus facilitating measurement directly on the component itself. In addition, separate tests will be required on the effects of the concrete additives and admixtures used for fine grained concrete matrices on electrical conductivity patterns generally. The authors would like to acknowledge the "Deutsche Forschungsgemeinschaft" (DFG) for their support of the research work.